Why do we have a plan? In 2008, Brandon University students voted overwhelmingly in favour of creating a Health and Dental Plan for students who do not have coverage otherwise. Why Did We Change Providers for 2015/16? During the 2014/2015 year, your BUSU Executive Members and Staff had meetings with alternative Health & Dental providers. These meetings took place after our previous Health & Dental brokers had designed a poor opt-out system and benefits were required to decrease again. After lengthy discussions surrounding what would be best for students, your council decided to sign with Student VIP (C&C Insurance). We are happy to inform you that Student VIP has been able to increase several items in your benefits package, provide us with wonderful customer service, and still keep the plan at the low cost of $250.00. 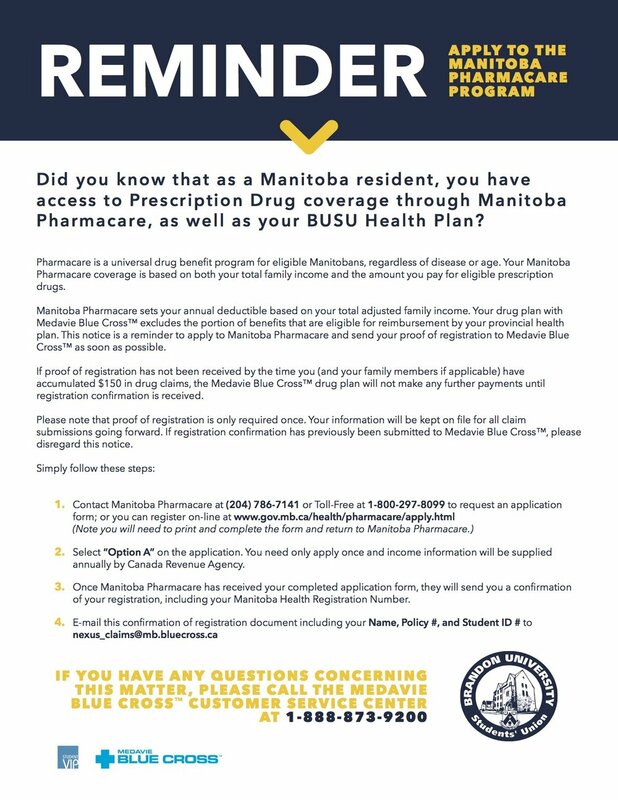 For more information on your new plan, please visit www.studentvip.ca/busu37 or call (204)727-9660. Once you have signed-in or completed registration, you will be able to begin the opt-out process. • A confirmation e-mail will be sent to your brandonu.ca email address. • Please keep the confirmation email for your records. • It generally takes about two weeks for the credit to appear on your student account. • Please note that if you do not opt-out by September 24th, we will be unable to remove you from the plan. October 22nd, 2018 is the Opt-In Deadline. Once you have signed-in or completed registration, you will be able to begin the opt-in process (Please note that the cost of enrolling dependents has changed from last year). Submit your information/your dependents’ information.